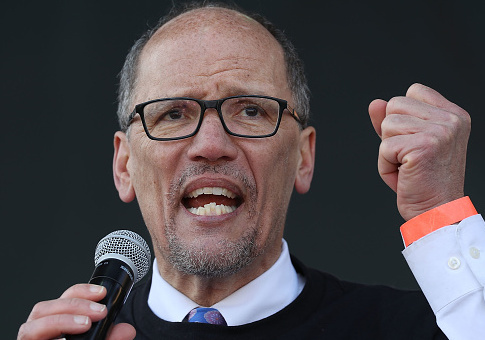 Democratic Party chief Tom Perez wants to see entry-level political operatives unionize. The former secretary of labor dodged questions about the party's spending on Tennessee Senate candidate Phil Bredesen, the state's former Democratic governor, and instead called for a "living wage" for campaign operatives. "If Phil Bredesen is so independent, how come you're trying to raise so much money in order to elect him?" asked a campaign tracker after Perez left one Tennessee event. "How much money do you make an hour?" Perez said. "Because the trackers that I have met just aren't making a living wage." Perez avoided follow-up questions about the national party's involvement in the race to fill retiring Republican senator Bob Corker's seat and once again voiced his concern for the working conditions of campaign workers. "We need a trackers' union," he said. Campaign trackers have become the norm for both parties in recent years. They are typically entry-level workers, interns, or volunteers who videotape opposing candidates at various events hoping to capture embarrassing moments that may otherwise evade popular attention. In the past it was unthinkable that political staffers would form a union, but there are a growing number of Democratic candidates whose staffers have joined the upstart Campaign Workers Guild. The movement has faced some resistance in Democratic circles. In June, union officials said they were forced to fight "tooth and nail" to organize staffers for Florida congressional hopeful David Richardson, and a former staffer complained that workers were fired in the midst of the unionization campaign. CWG was founded in part to force Democrats to live up to their pro-labor values. "We, as campaign staff, believe that campaigns cannot fully fight for workers' rights while they're exploiting their own campaign staff. Pro-labor candidates must hire unionized organizers," the guild says in its manifesto. "The Democratic Party, in particular, is a champion of labor rights, except where its own laborers are concerned." The DNC remains without a union, despite a supportive Tweet from Perez deputy and accused domestic abuser Rep. Keith Ellison (D., Minn.). Neither the DNC nor the guild returned requests for comment. The Tennessee Republican Party confirmed that its tracker is a paid employee rather than an unpaid volunteer. A spokesman said Perez's comments were more in line with Washington, D.C., than Tennessee, pointing to the state's right to work law, as well as votes from workers rejecting the United Auto Workers. "Resistance Leader Tom Perez clearly doesn't spend much time in Tennessee, a proud right-to-work state, or with everyday Tennesseans who enjoy the pro-growth solutions Republicans champion," the party said in an email. "Tennesseans have repeatedly rejected Democrats' job-killing policies and they'll continue to do so this November." This entry was posted in Politics and tagged Democrats, Minimum Wage, Tom Perez, Unions. Bookmark the permalink.